Mishinigig Ogimaa Oboonidiyaak ("Mighty Otter Chief Pontiac"). Sterling silver and 14K gold bolo tie equiped with a black leather lanyard. 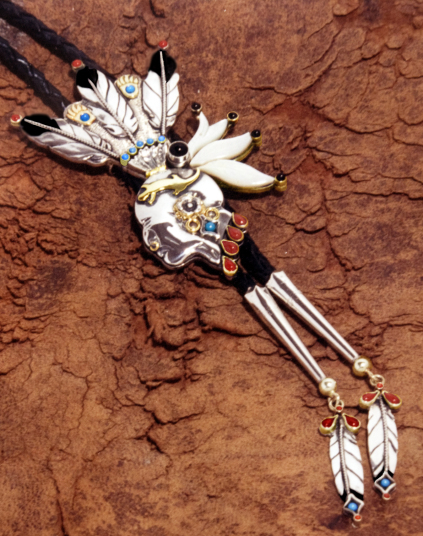 This bolo tie was designed as a tribute to Ogimaa Oboonidyaak, or Chief Pontiac. The three silver eagle tail feather in Oboonidyaak's scalplock symbolize the political and military power of the Three Fires. The ermine tails (made of mother-of-pearl) at the back of Oboonidiyaak's head represent the Nations that make up the Confederacy: the Ojibweg, the Odaawaag, and the Bodéwadmik. The Misi-Zaagiwininiwag (Mississauga) are represented by the smaller tail. 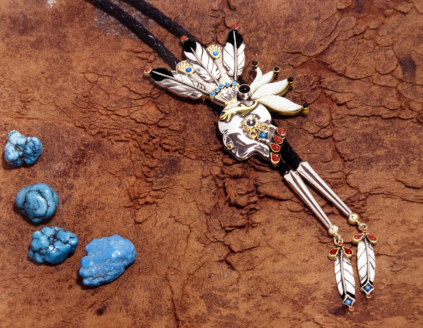 The combination of the silver eagle feathers and gold bear paws in the headdress signifies the summum of power, both spiritually and military. The red coral "blood drops" are symbolic of the eight Zhaaganaash forts that Oboonidiyaak's allied forces managed to destroy in the year of 1763. 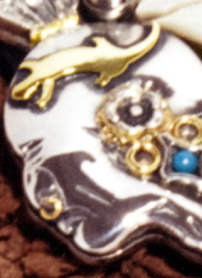 The stylized gold otter design placed at the side of Oboonidiyaak's head stands for his doodem or clan, and the amazing fighting spirit he showed in his life. Finally, the two eagle wing feathers adorning the silver and gold tips symbolize the friendship and cooperation between the Anishinaabe Nations and the Nation of the Ondowahgah Haudenosaunee, represented by their main war leaders, Oboonidyaak and Guyasuta. To read more about Chief Pontiac go to our art blog.